Europe’s oldest university city has plenty of distinctive features, from Ferrari factories and epic arcades to great food, lively nightlife and even its own leaning towers. 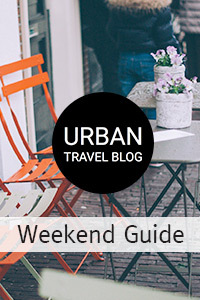 Marissa Tejada reveals the best things to do on a city break. 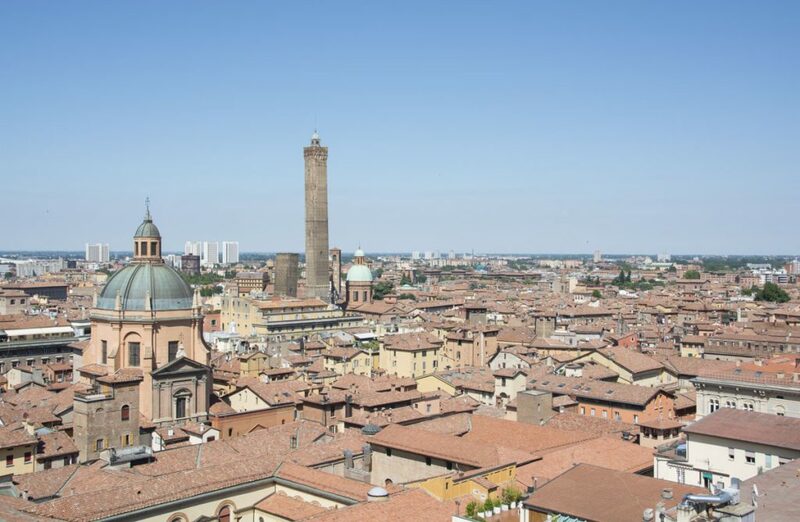 Bologna is hardly high profile, keeping under the radar in northern Italy. Its proud, edgy, political and foodie vibe flows under impressive stretches of medieval colonnades and arches. 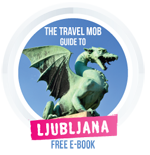 Get to know the city’s nicknames and you’ll start to understand what the city is about. La Grassa (the fat one) refers to its rich tasty cuisine – the region is home of ragu and bolognese. La Dotta (the learned one) pays homage to the Western world’s oldest university founded in 1088. La Rossa (the red one) cites the colour of its terracotta porticoes and rooftops and the left-wing love that thrives here. A hard-working tech sector pounds the pavement but come nightfall students laze out in graffiti stricken piazzas. Just outside the city, Bologna’s villages are the testing streets of Lamborghini, Ducati and Ferrari – all have factories here (you can even take a “food and Ferrari tour“!). Meanwhile, back in the old town, bicyclists of all ages breeze swiftly alongside and in between car traffic to get from a to b. To climb the 11th-century Torre Asinelli, the tallest leaning tower in the world, head to Piazza di Porta Ravegnana where 500 steps lead you to the summit and panoramic vistas below. Local legend has it that anyone who climbs the tower before graduating will not get their degree. The smaller Garisenda Tower leans at an even larger angle and in fact had to be shortened in the 14th century to prevent it from toppling over. A view of the Two Towers. The city’s main square is Piazza Maggiore, fronted by the layered facade of the San Pietro Church. It constantly buzzes with young and old citizens, with plenty of lovely café corners to watch daily life unfold. A tangle of mom-and-pop shops selling goods that made this town the gastronomic capital of the region, and some say of Italy, are right off the Piazza Maggiore on Via Clavature. Turn a few corners for an elevator ride up the Terazza di San Petronio where you’ll get the best view of those famous wonky twin towers. Views for miles from the Terazza di San Petronio. 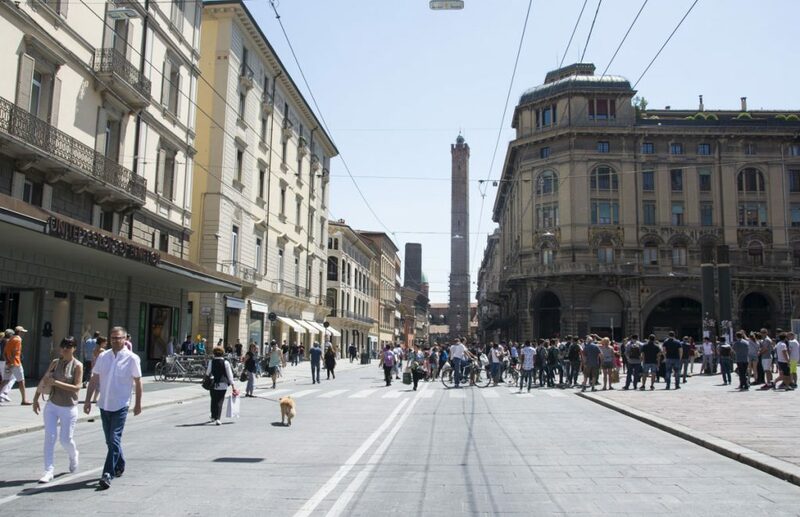 Via dell’Indipendenza is the shopping hub of Bologna, lined with Italian brands and international chain stores and is especially lively during traffic-free weekends when no cars or exhaust gurgling vehicles are sharing the streets. For a range of guided tours (many featuring great food and wine too!) around the old town try Get Your Guide. The hipster vibe is alive and well along the Via del Pratello, a historic street that since the 60s has been the scene of Bologna’s political movements and cultural initiatives. Walk down its stone lanes as bicyclists whizz past you and sit among the neighbourhood crowd relaxing under the porticoes in one of the dozens of gritty yet cosy beer bars and cafes. Locals enjoying the laid back vibe at September 11 Park. The 70s birthed The Blue Angel, a cinema club that later became the Cineteca di Bologna, a prominent archive of more than 40,000 films, covering the silent age to modern times, including art and amateur films and long lost B-movies. It’s also home to the Chaplin Project a big initiative to bring restore Chaplin’s films. Pop in for a film screening among film lovers. Just north of Via del Pratello, stroll into Parco 11 Settembre 2001 or September 11 Park. 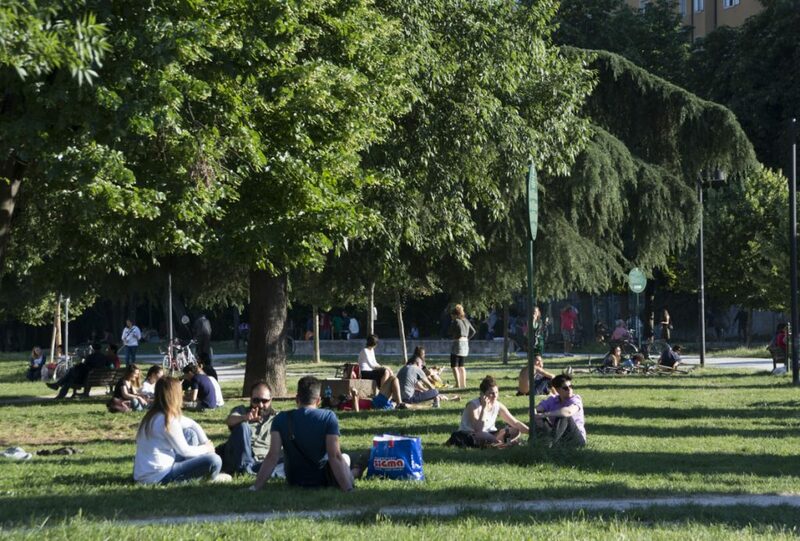 Its chilled, laid-back atmosphere will have you wanting to sunbathe on the lawn with locals, or join in with community events. Centro Sociale XM-24 after the crowds leave. Within walking distance from the historic old town, but way off the tourist map, the district of Bolognina (“little Bologna”) hugs another hipster area with a strong sense of community: Centro Sociale XM-24. 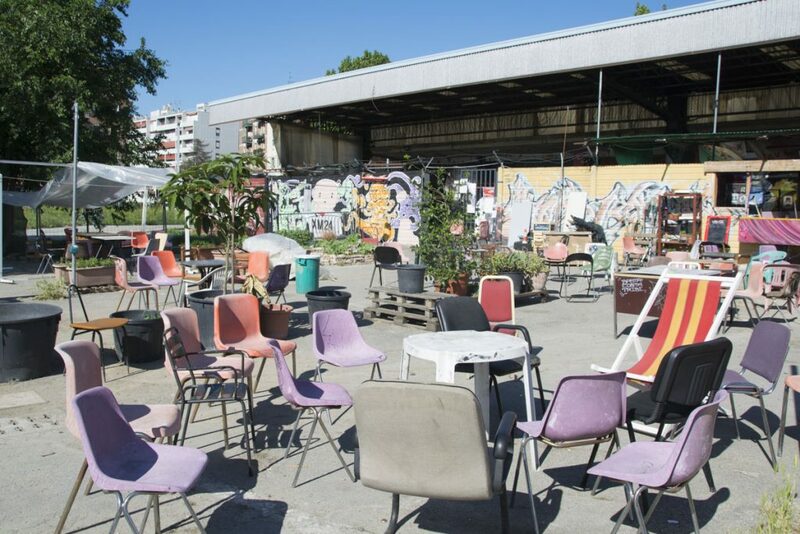 Dipped in fantastic street art with flea market chairs and couches scattered across a concrete lot, XM-24 encourages diverse minglers, shoppers and strangers to meet up by the food stalls. The market features local goods, organic fruits, vegetables and homemade Italian specialties. In one corner, under a canopy of more colourful graffiti and street art, vintage clothes, old books and more local goods grab an audience. Chilling at Centro Sociale XM-24. Down the road in Bolognina’s Mercato Albani, the same kind of fresh produce and products are offered from small mom-and-pop market stalls. 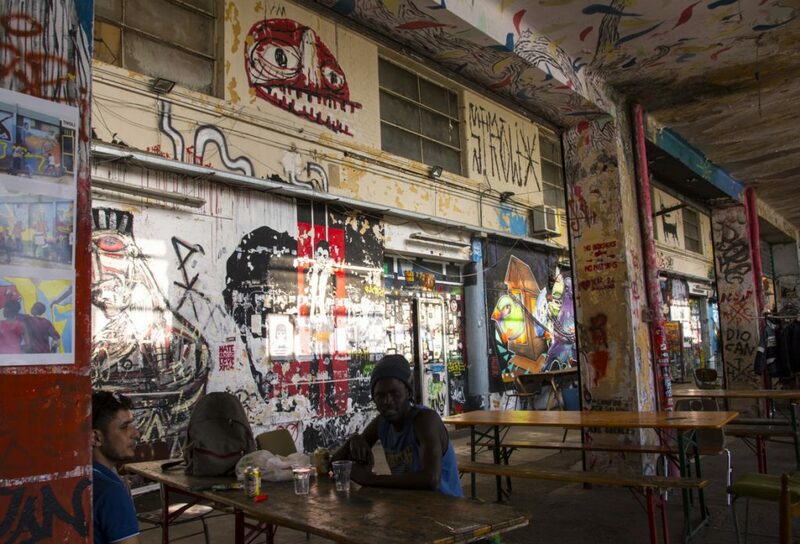 When the day is done, the shuttered shop, garage-style doors are pulled down to reveal a kind of street art museum, as each is painted in pop graffiti style by local artists. 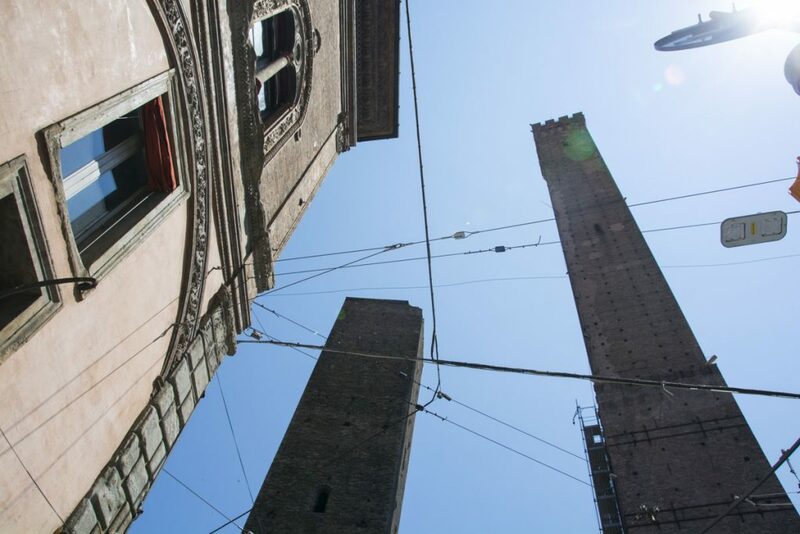 For hikers and explorers, walk the way the ancient militaries walked on the Via degli Dei which connects the center of Bologna to Florence. The scenic ancient 135-kilometer path crosses all the Tuscan-Emilian Apennines, retracing parts of the ancient Flaminia Military Roman Road. Various itineraries mark it as an experience to be done in four stages by foot, two by bike or somewhere in between. For more hiking fun, walk the San Luca under the longest portico in the world that stretches nearly four kilometres and has 666 arcades. At the top, stretch your legs at the beautiful sanctuary of the Basilica of San Luca. It may not be where gelato was invented but it is the city where you can learn to create your own. The Carpigiani factory gives out their “degrees” at Carpigiani Gelato University. A bit of math is involved, but in the end, students for the day can graduate to become an artisan gelato master, or at least walk away knowing what it takes. 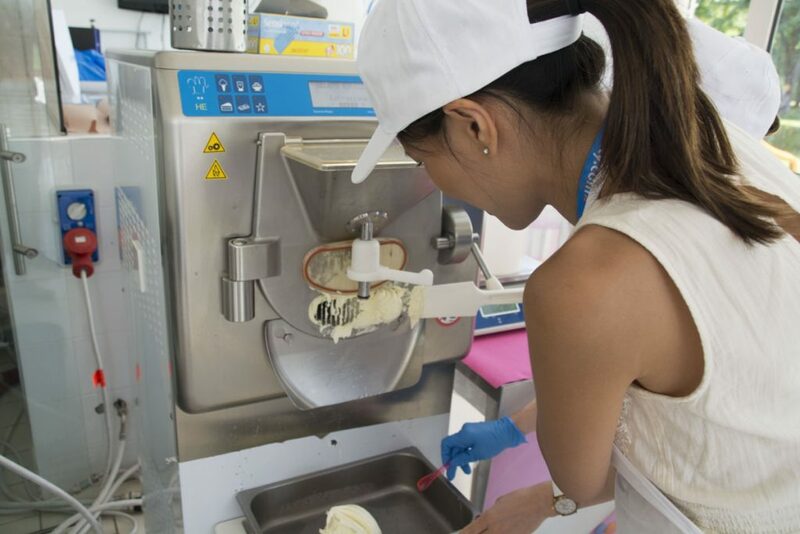 For the more advanced, the university holds special classes and workshops for gelato makers from around the world. Also on campus, the Gelato Museum delves deep into the deep history (oh it goes way back), the love and worldly effect of the Italy’s famous frozen dessert on food cultures around the world. Finally to get out of the city and experience the local vineyards check out this full day wine tour that takes you to two different wineries and the medieval village of Dozza. Luxury choice goes to the city’s only five-star hotel – Grand Hotel Majestic Baglioni -which sits in the heart of the city on Via dell’Indipendenza, steps from the Piazza Maggiore and the famous Two Towers. For a mid-range stay, consider the Albergo Al Capello Rosso, steps from Piazza Maggiore. The hotel itself may date back to the 14th century but aims to pampers its female guests today with uniquely decorated Lady Rooms which feature silk kimonos, tea facilities and skirt hangers. For a central, cheap but clean stay head right off the pedestrianised Via Ugo Bassi to the Albergo Panorama pensione. No design, but panoramic views can be appreciated. While in Bologna, eat like the Bolognese. Think tortellini, tagliatelle al ragù and cold cuts like mortadella, crescentine with cold cuts and soft cheese like stracchino and squaquerone. All go perfectly with the local white wine Pignoletto or red Lambrusco and Sangiovese. 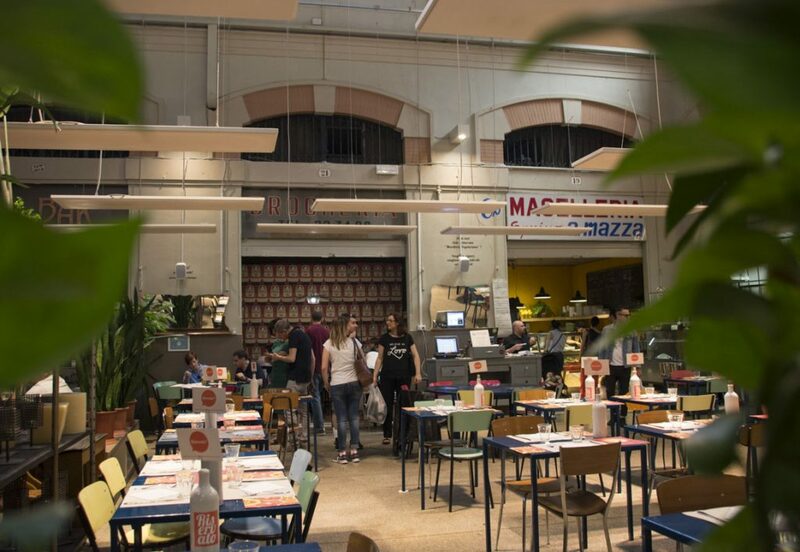 Tick off your “what to eat” list by heading to Mercato Delle Erbe, an indoor deli market dotted with tiny restaurants, artisan food stands and a communal cafeteria that’s abuzz day and night with locals. Yep, Bolognians are crazy about markets so also stop by the stalls on Via Rialto Serre dei Giardini. Trattorias are everywhere and Bolognians are picky so the quality will likely be good. Some local favorites: Le Stanze for sheer atmosphere, seafood at Osteria Broccaindosso and Osteria Dell Orsa for the tigella bread. For an excellent trattoria in Bolognina, head to Trattoria di Via Serra. Gelaterias are everywhere but locals attest to Funivia, La Sorbetteria, or La Cremeria. Little shops, a lot of good food at Marcato Delle Erbe. When the sun sets a sort of open-air block party takes over the squares and streets and that’s part of the nightlife fun. Weekends are free of central city traffic and even by midnight Bolognian families push strollers down them, high heels stomp through the arcades and student crowds brisk past them all. Big meeting points are Piazza del Nettuno and Piazza Maggiore, where you can be in the thick of locals who stop to think where to go for the night. 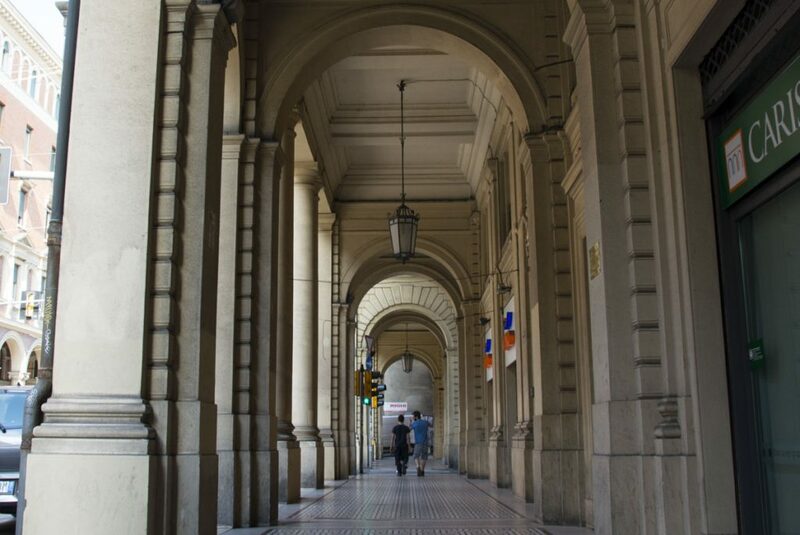 For a fancier night out, get dolled up and head under the portico on Via de Musei, where posh cocktail and champagne bars await. Besides the hipster district of Via di Pratello and its beer bars, also check out Via Rialto, the heart of Bologna, and steps away from the oldest theater of Bologna: the Teatro Duse. If exploring outside the city walls, love the relaxed local vibe at Fermento in Bolognina. If wine is your thing, head to Enoteca Risanamento or Acca Winery to sip the night away. 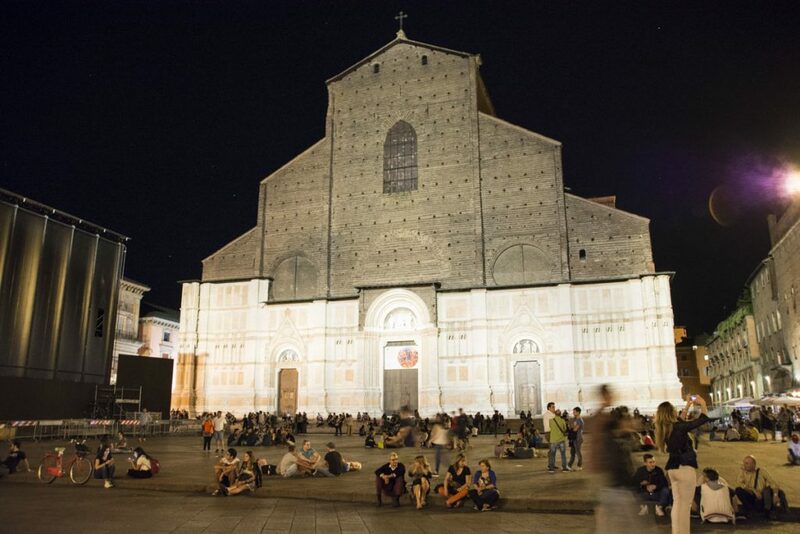 Night life lights up at Piazza Maggiore. Ryan Air flies direct to Bologna from several European hubs. British Airways flies direct to Bologna from London Heathrow and easyJet from London Gatwick. The train is a good option from cities around Italy (trenitalia.com) is a good option. Bologna is about a half hour from Venice, 40 minutes from Florence and two hours from Rome via train. For more about Bologna from insiders check out Mylovelybologna.com, Bolognauncovered.com and the super helpful official tourism board site, Bolognawelcome.com. Fodor’s has a section dedicated to Bologna in its Fodor’s Italy travel book. For reading about Bologna through the eyes of novelists, the city seems to be a thrilling place. Check out John Grisham’s The Broker, Giampiero Rigosi’s Night Bus and Carlo Lucarelli’s Almost Blue. Hollywood has overlooked Bologna – mostly. Oscar winning director Gabriele Salvatores adapted – yes, a crime thriller – Quo Vadis Baby, set in Bologna, for a 2005 film. Pupi Avati, one of Italy’s most famous directors is a local, and his films take place in his hometown or right on the outskirts. Don’t forget to check out all our favourite city break destinations, including other Italian greats such as Rome, Milan, Trieste, Venice and Verona. Marissa Tejada is an American journalist, travel writer and author living in Athens. She's a regular contributor to Forbes Travel, Wine Enthusiast, GQ and Urban Travel Blog. Full bio here.